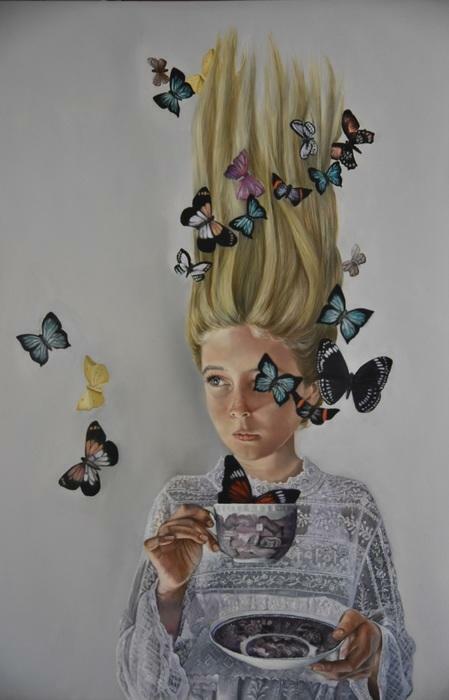 Tara Spicer Art offers Fine Art that is of a surreal and deeply whimsical nature. Available for Galleries and Investment. Select an original work for your own delight or Commission a piece to suit your needs. All sorts of shapes and sizes! Hi guys, I am so excited to let you know that my Prints are now available in a large range of sizes to suit your desires! I will be hosting a competition soon where you will have the opportunity to WIN YOUR OWN LARGE PRINT… more info coming soon. Click here to check out what’s available. Beautiful new print now available and new bigger sizes too! Shortlisted for the BLUETHUMB Art Competition! Some very exciting news to be announced… my beautiful piece “A Drop of Enchantment” has been short listed for the Annual BLUETHUMB Australian Art Competition. The top 100 can be found here. Here’s hoping for some great success in this exciting competition. Finalists will be selected on the 4th November. Some exciting new aviator paintings are currently in the evolutionary phase on easels in the art studio. My paintings are evolving a little slower than they have previously but with a little more delight and magic. Time is a precious thing and so is health and so I am trying to learn to devote a little time to all aspects of my life where my attention is needed. But despite this I am still very excited to be bringing you more and more paintings and composited photographs that bring warmth and delight to your soul and a smile to your face. Behind the scenes I am also currently designing a new range of labels for a local business and their product range. This is a very exciting project and I can’t wait to lift the veil on this incredible collaboration. Now available as a limited edition print through my ETSY store. I absolutely love the simplicity of the raw linen background of this piece. In other news, hold onto your goggles Aviation fans as there is talk of a hole new series of “Young Aviator” paintings to come your way! I am excited to launch these when I can and am planning some exciting props for this series including more goggles and aviation hats as well as shopping trolleys and smoke emitters … I will be sure to post mini detail pics of these as they are in production AND there might even be a video to go with it! AND for those who have been patiently awaiting for the second part to the “Painting a black and White Portrait” Course, I promise I will finish editing the how to video soon, ready for you to complete this course. I have loved seeing what you have created so far and I am really proud of all of your efforts. Farewell for now… I am off up the mountain for some exercise before I hibernate in the studio for a few more hours! “Breathing Space”… I have been doing so much packing and moving and culling of possessions and setting up of prized possessions and articles of clothing of late. It has been at times exhausting and at times quite liberating. I find it interesting to take note of what it is that I keep, that I hold dear. My mum had recently given me an extremely old box of stuff that was wrapped in newspaper of the day, which I promptly put into storage without even glimpsing at. To now have the time to go through this box… I find that she has kept and carefully wrapped clay figures that I had made probably 30 years ago! Along with drawings I had done and books filled with writing and school projects. Yes, through all of my culling, these are the things that I have chosen to hold dear. As I handle them, I am instantly taken back to the time that I first made them or drew them. I find it interesting that it is such a strong connection to my past and who I was as a kid and who I wanted to be when I grew up! It is this ‘knowing’, that I have become the person that I wanted to become, the mother that I wanted to be, the artist that I dreamed of becoming… that gives me breathing space. I am relieved. I can stop trying so hard and start enjoying the present. Sometimes our journey through life can be so hard, that we feel that we just want to keep our head in the clouds, not stick too close to reality, keep daydreaming and imagining up fantastical stories and adventures. Sometimes we feel as though we secretly might need to have our bags packed, ever at the ready, in case the wind changes direction and takes our mind or heart with it. But sometimes, just sometimes, the wind settles and the clouds clear and the breathing space that we need…. is right here at home. How nice. These beautiful Fine Art Prints come matted, ready for framing. The are printed with Archival Ink onto Photographic Rag Paper and are signed and numbered by myself personally. There are only 5 of these printed and sold EVER!!!!!!! They are selling at $220 each. I am now offering online workshops that you can check out here. If you got this far down the text… thankyou so much for taking the time to read… I hope that you enjoyed what I had to share. I would love to hear from you if you would like to share your thoughts on what brings you your own personal sense of Breathing Space. Auction of a very special painting! … I never thought I would let go of this painting… in fact I had always imagined this painting hanging neatly above my bed to bring me beautiful dreams! BUT… this weekend…. Dreamologie is being auctioned off to the highest bidder in a silent auction to raise funds for the Coolum Boardriders Club . This is an awesome opportunity to purchase a prized artwork, of great value, at a very affordable price! Heck even I want to bid on it!!! Here’s hoping that this awesome painting goes to a big fan.